OpenStack have been in the latest years, a key competitor in the virtualization world, providing a solid and versatile solution. This technology has been mainly deployed in Linux environments and since a couple of years has been introduced in the Solaris OS, as an alternative to deploy zone virtualization in a friendly way, adding all the benefits of the OpenStack Architecture (Data Redundancy, High Availability, Virtualization templates, among other things). For those who are not familiar with this virtualization solution, here you can find a diagram of the main OpenStack components and an explanation of each one of them. The Nova compute virtualization service provides a cloud computing fabric controller that supports a variety of virtualization technologies. In Oracle Solaris, virtual machine (VM) instances are kernel zones or non-global zones. Zones are scalable high-density virtual environments with low virtualization overhead. Kernel zones also provide independent kernel versions, enabling independent upgrade of VM instances, which is desirable for a multi-project cloud. The Neutron network virtualization service provides network connectivity for other OpenStack services on multiple OpenStack systems and for VM instances. In Oracle Solaris, network virtualization services are provided through the Elastic Virtual Switch (EVS) capability, which acts as a single point of control for creating, configuring, and monitoring virtual switches that span multiple physical servers. Applications can drive their own behavior for prioritizing network traffic across the cloud. Neutron provides an API for users to dynamically request and configure virtual networks. These networks connect interfaces such as VNICs from Nova VM instances. The Cinder block storage service provides an infrastructure for managing block storage volumes in OpenStack. Cinder enables you to expose block devices and connect block devices to VM instances for expanded storage, better performance, and integration with enterprise storage platforms. 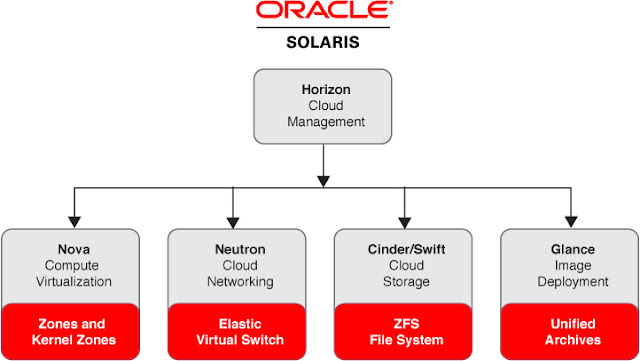 In Oracle Solaris, Cinder uses ZFS for storage and uses iSCSI or Fibre Channel for remote access. ZFS provides integrated data services including snapshots, encryption, and deduplication. The Swift object storage service provides redundant and scalable object storage services for OpenStack projects and users. Swift stores and retrieves arbitrary unstructured data using ZFS, and the data is then accessible via a RESTful API. The Glance image store service stores disk images of virtual machines, which are used to deploy VM instances. 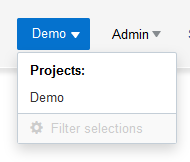 In Oracle Solaris, Glance images are Unified Archives. The images can be stored in a variety of locations from simple file systems to object storage systems such as OpenStack Swift. Glance has a RESTful API that enables you to query image metadata as well as retrieve the image. Unified Archives enable secure, compliant, fast, and scalable deployment. The same Unified Archive can be used to deploy either bare-metal or virtual systems. You can use Unified Archives with the Automated Installer (AI) to rapidly provision many systems. Horizon is the OpenStack dashboard where you can manage the cloud infrastructure and computing infrastructure in order to support multiple VM instances. 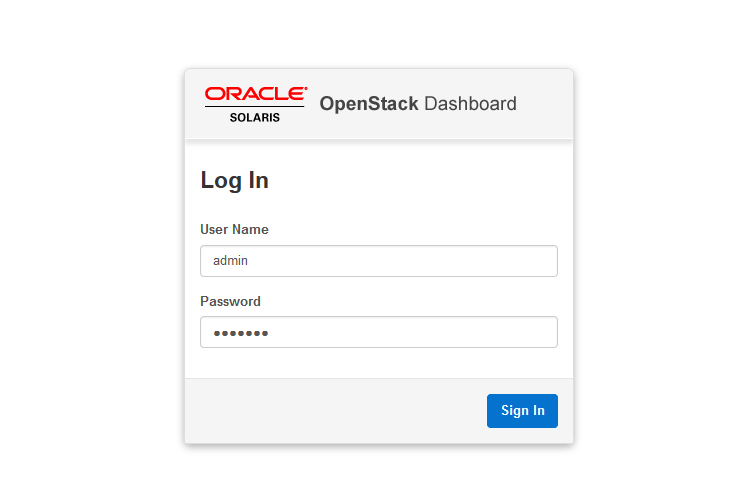 The dashboard provides a web-based user interface to OpenStack services. The Keystone identity service provides authentication and authorization services between users, administrators, and OpenStack services. The Heat orchestration service engine enables developers to automate the implementation of an OpenStack infrastructure. The engine is driven by templates that contain configuration information and post installation operations to deploy a customized configuration. Each OpenStack service is represented by one or more Service Management Facility (SMF) services. SMF regulates OpenStack services, for example, by performing automatic service restart in case of failure or full service dependency checking for more precise and efficient startup.